ZOOM! 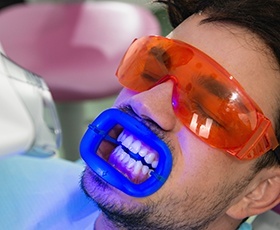 Teeth Whitening in Downtown Washington, D.C. Your smile can make a big first impression on the people you meet every day – but is it making the right impression? If you’re struggling with self-consciousness because of dental stains, discoloration, or dark spots, a makeover may be overdue. At Davidson Dental Associates, our team is happy to offer state-of-the-art ZOOM! 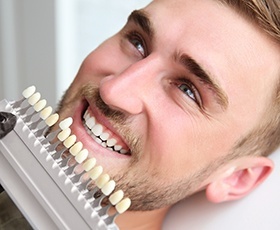 teeth whitening as an excellent alternative to lackluster whitening strips and pharmacy products. This procedure is completed right here in our Washington D.C. office, and it only requires one appointment of your time, helping you keep your busy schedule intact. Contact us today to schedule your first consultation! Once the patient has gotten settled into the treatment chair, our team will start by isolating the teeth from the gums through the use of a rubber dam. Then, the high-grade whitening gel is applied gently and consistently to your enamel surfaces. Finally, we’ll expose the gel to the state-of-the-art ZOOM! light, which penetrates the teeth to gradually eliminate deep stains and discoloration. After around 90 minutes, your smile will be anywhere from 6-10 shades brighter! Better yet, we’ll provide you with a take-home kit that can be used for touch-ups in the comfort of your own home. With this type of regular maintenance, patients can expect to enjoy their sparkling improvements for several years. If you’re interested in undergoing a stunning smile transformation with ZOOM! whitening, consider taking advantage of our special! For a limited time, this procedure is only $499 (regular price is $849), which includes the take-home trays. You’ll save nearly 50%, and your teeth will look beautifully bright in every future photo. Just let our team know when you’re scheduling your appointment that you want to use this deal, and we’ll help you get started.